For a material to be listed on the ABAA website, the manufacturer shall complete the evaluation criteria process outlined in the ABAA Process for Approval of Air Barrier Materials, Accessories and Assemblies document. Once a manufacturer has demonstrated to ABAA that their material meets the established criteria and has completed the process of submitting test reports and supporting documents for their material, they will be listed in the tables below as an “ABAA Evaluated Air Barrier Material” and included in the ABAA Master Specifications. Air barrier materials have product-specific test properties that they have to test to ensuring they will meet rigors encountered during their service life and under the buildings imposed loads. Self-adhered Sheet Air Barriers are tested for air permeance, water vapor permeance, resistance to puncture, tensile strength, water resistance, peel or stripping strength of adhesive bonds, lap adhesion, low temperature flexibility, nail sealability, pull adhesion, tear Initiation and tear propagation and crack bridging. Liquid Applied Membranes are tested for air permeance, water vapor permeance, and nail sealability, pull adhesion and crack bridging. Medium Density Sprayed Polyurethane Foam (SPF) are tested for air permeance, water vapor permeance, flame spread characteristics, thermal transmission, compressive strength, density, tensile strength, dimensional stability, water absorption, open cell content, pull adhesion and crack bridging. Mechanically Fastened Commercial Building Wraps are tested for air permeance, water vapor permeance, dry tensile strength or dry breaking force, pliability and water resistance. Boardstock – Rigid Cellular Thermal Insulation Board are tested for air permeance, water vapor permeance, compressive strength, thermal resistance, flexural strength, water absorption, dimensional stability and tensile strength. Gain a competitive edge over non-accredited manufacturers. 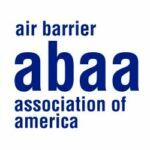 ABAA manufacturers are viewed as the manufacturers of choice for air barrier materials and assemblies. Manufacturers with Evaluated Materials are included in the ABAA specifications, which results in an increase in sales and greater market exposure, along with the ability to play on a level playing field with other manufacturers. Download all documents and respective product category. These documents will provide you with all the information needed to get the evaluation process started.